A whimper, not a bang, that would seem to be the final entry in the incredible story that has been XH558’s career as a civilian display act, no farewell party for the masses on this occasion though, like other fond farewells have presented. The prospect announced late last night, of a 15 minute flight which many assumed would be nothing more than a quick circuit around Robin Hood Airport is certainly a far cry from what many would have wanted to see as this legend’s final bow. A truly iconic sight that will never be seen in the skies again after today. Yet as I watch those final, fleeting moments back, even on the video there is a great sense of occasion. Martin Withers performed something I certainly don’t remember seeing before in a Vulcan display. Tucking the undercarriage up early and keeping the Vulcan flat and low rather than the great leap into the air we are used to. 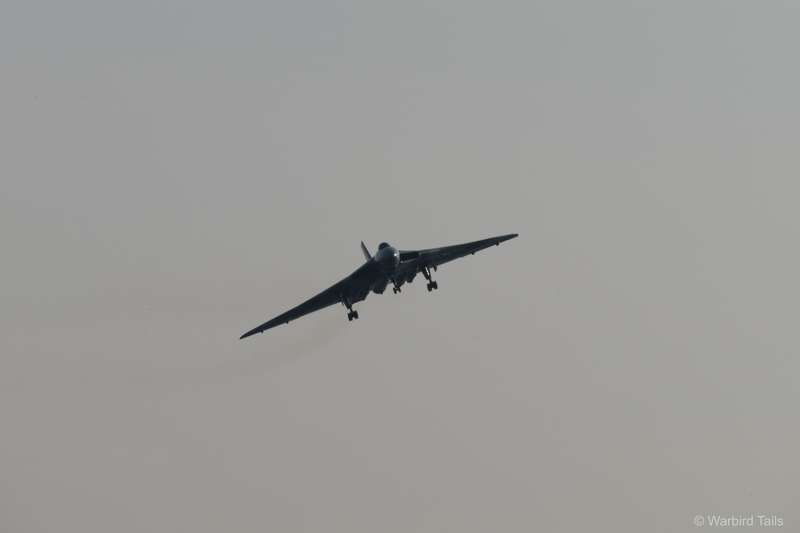 This was followed by a characteristic zoom climb and an iconic Vulcan wingover, now that is how you say goodbye! The final touchdown has taken place and the book can be closed on a memorable and important project. We were blessed with wonderful light for the Vulcan’s farewell at Shuttleworth in October. Looking back over the years, I found it hard to believe how watching such a prestigious event on film, be it live, or after the event, could possibly raise the same emotions as being there in person. Of course it didn’t but it still felt like a very real way to say goodbye to that familiar shape in our skies. Perhaps, in light of what has happened this year the fact that there was a final flight was allowed at all is something to be thankful for. The rights and wrongs of XH558’s final few flights can, and will, be talked through again and again for years to come no doubt. But in the spirit of “smiling because it happened”, rather than “crying because it’s over”, I wanted to take a look at some of my personal Vulcan memories. 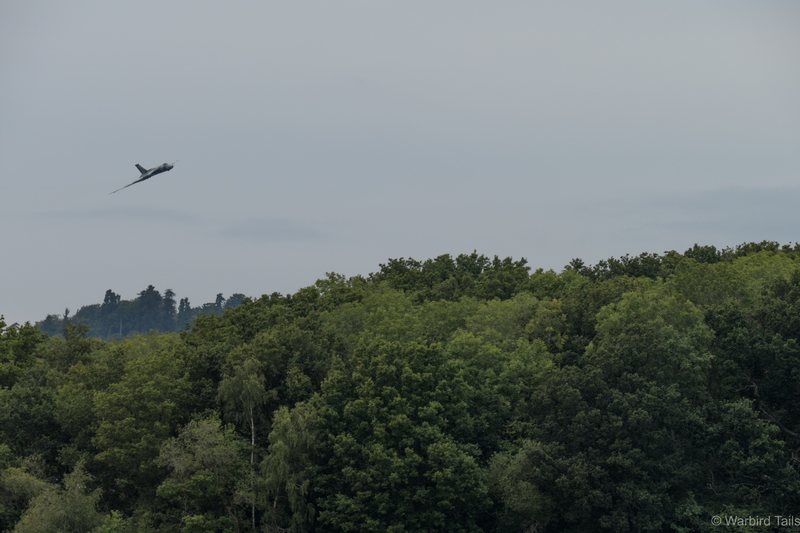 Over the trees at Dunsfold in the gloom seems to have become a Vulcan trademark over the years. 8 Years ago, on the 18th October 2007 4 Bristol Olympus engines thundered into the sky for the first time since Concorde’s retirement in 2003, only this time they were powering something even more special. Returning Vulcan XH558 to flying condition was treated by many as something a pipe dream, so finally seeing the aircraft lift off the ground again at Bruntingthorpe must have been a truly special occasion. I wasn’t there on the day but I fondly remember the news reports and excitement in the community of the spectacle that the 2008 season would bring. I grew up on stories of the Vulcan shaking the ground and setting off car alarms, it certainly had a reputation to live up to. 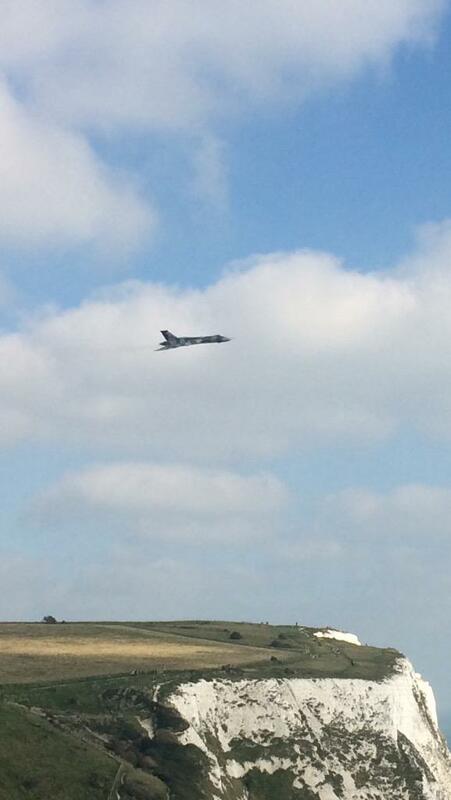 Another view of XH558 in flight. My earliest memory of this aircraft is very hazy, it was during a taxi run day at Bruntingthorpe in the 90s, presumably one of the final taxi appearances XH558 made before the restoration work began in earnest. I still remember getting an up close look at that iconic delta shape and being awestruck by the size of the thing, not to mention the hint of the noise and howl. 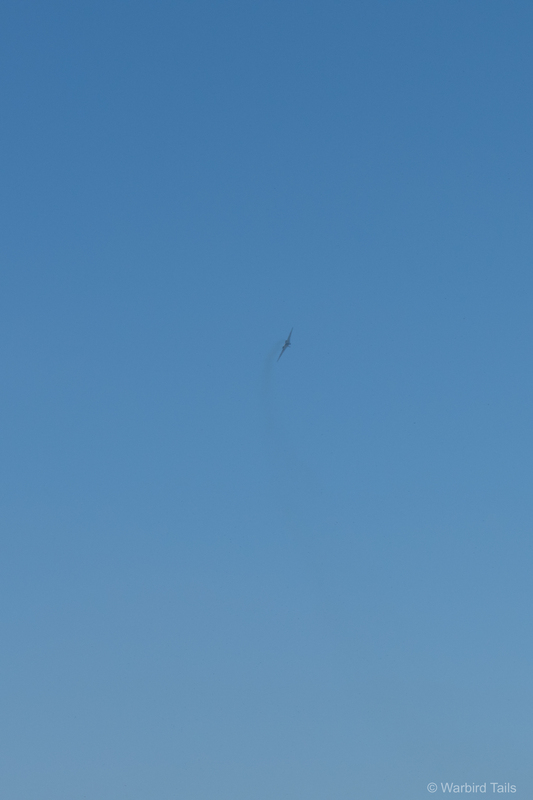 That classic smoke trail clearly evident as XH558 passes over another British Icon. My first sighting of the Vulcan was at Farnborough in 2008, an important venue for the Vulcan as a type and fitting for myself as well, my grandfather flew Vulcans from the airfield during his service there. As has always been the way with the Vulcan there was plenty of tension surrounding the display and whether the aircraft would be serviceable. Soon enough it was time for the Vulcans slot. The take-off was everything I had been told, the glorious Vulcan howl was followed by this thundering bomber leaping into the air before shaking the ground on climb-out, superb! That first display seasons routine was a little more subdued than we have become used to but simply seeing that shape patrolling the skies of the UK again was simply incredible. 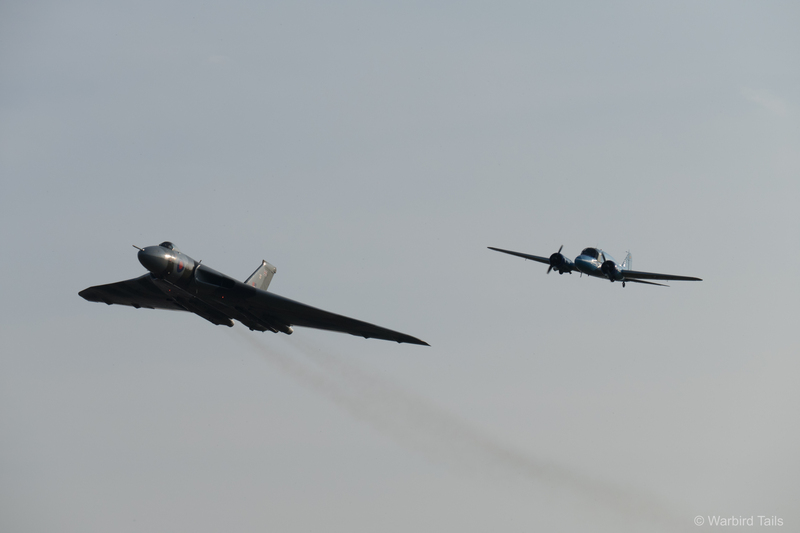 The Vulcan with both Lancasters, certainly something to remember. In the years that follow I must have witnessed countless Vulcan displays, with memorable appearances at Dunsfold on many occasions, including last years routine with the three ship Gnat display team. 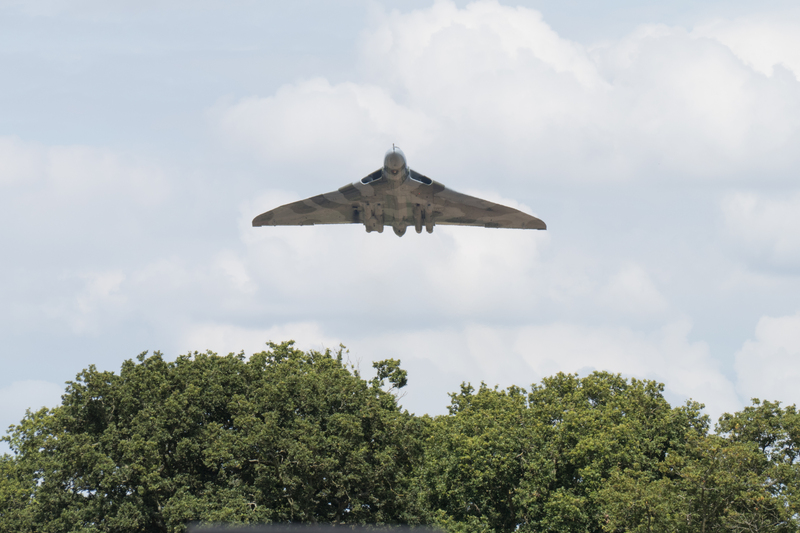 My ultimate “I was there moment” in relation to XH558 has to be Marham in 2014, watching as that classic Delta wing led the Lancaster pair over the airfield before pulling hard into a steep wingover is a sight I doubt many would have ever expected to see again. 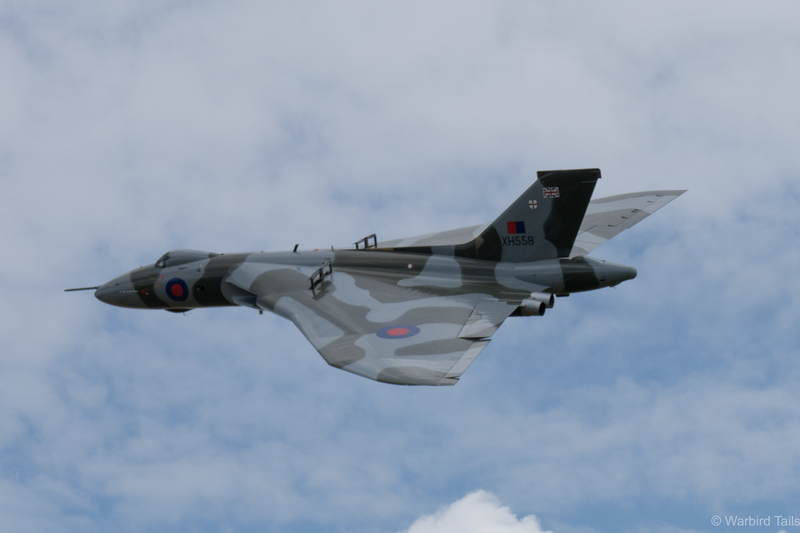 When it was confirmed that XH558’s flying days would come conclude following the 2015 season, a greater emphasis was placed on seeing the aircraft as much as possible before the final touchdown. Perhaps its familiarity with the recent appearances, but it seems that this year has presented countless memorable performances and certainly the first half of the season saw far more aggressive displays. 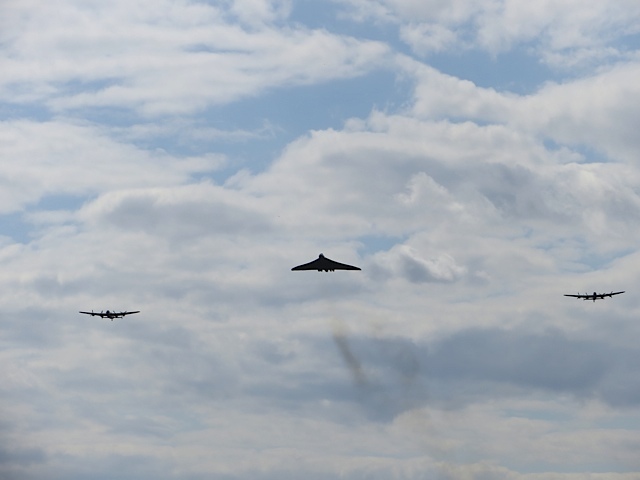 “That” moment, this will certainly stay at the front of my mind when thinking of XH558’s displays over the years. – Headcorn August 2015. I could go through each and every time I saw the Vulcan this year, but I’d be here all day. Memorable moments that stick in my mind are the July Shuttleworth appearance, a superbly elegant and close display by Martin Withers. My local airfield, Headcorn, was lucky enough to secure a display in August which again was a stunning performance at a small venue with plenty of noise and drama. A classic Shuttleworth scene with a twist! Then came Shoreham. It was a day that no-one wants to relive, but, rightly or wrongly it presented a memorable Vulcan moment. 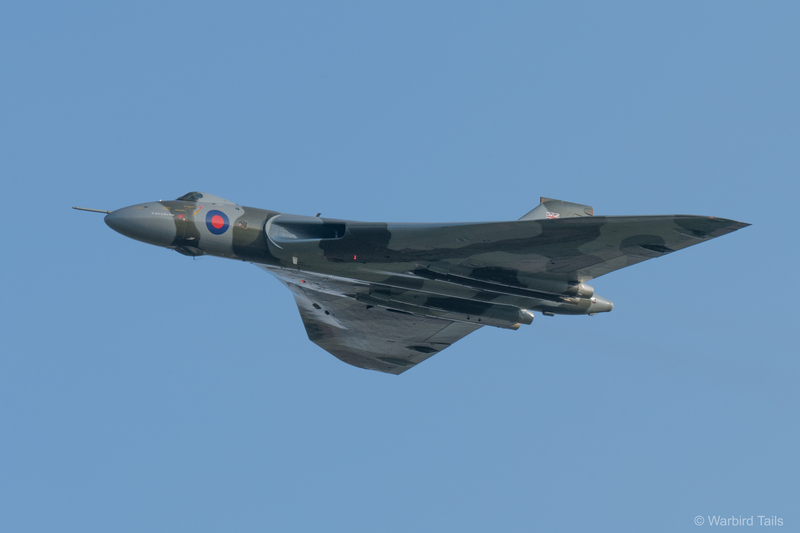 I was among those in the crowd, dazed by what they had seen, with little information forthcoming about the bigger impact of the accident, when it was announced that the Vulcan would make a single, high level pass in tribute. 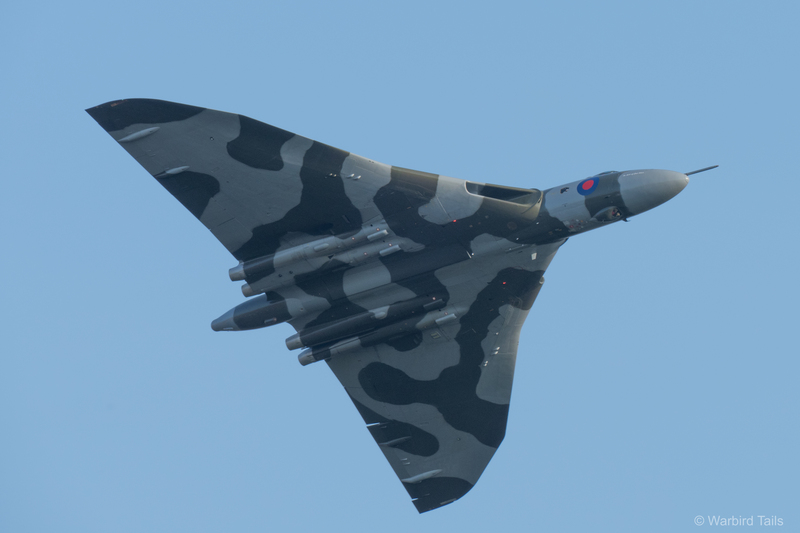 Watching the Vulcan approach as an entire airfield stood silent as it passed was a touching moment and some light on an otherwise dark afternoon for the airshow community. 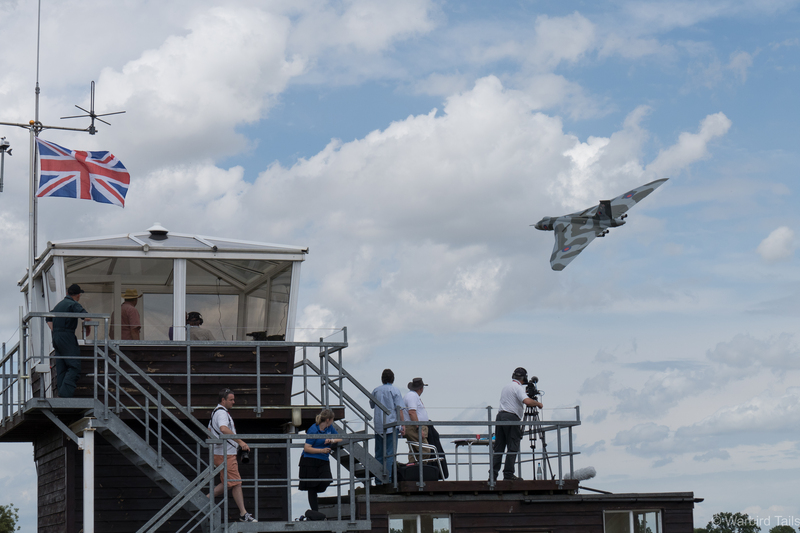 The restrictions placed on classic jets soon after the Shoreham incident led to uncertainty in how the Vulcan display would continue as the season played out. Kev Rumens display at Dunsfold the following weekend put fears to rest. The noise the Vulcan made on its arrival was something I haven’t heard before or since, It seemed that classic howl extended for the entire pass. The lower energy display did make for more noise for the final few performances of the season. One of the most fitting formations XH558 has taken part in over the years. Pairing up with BAE Systems’ Avro XIX/Anson. it was left to Old Warden to welcome the final public display of the Vulcan on the 4th October 2015, what a special display it was. Arriving in formation with a fellow Avro; BAE Systems Anson/XIX, Kev Rumens went on to put on a noisy, close display over the Bedfordshire countryside. Though the display was slightly wider than Martin Withers’ routine earlier in the year, it was a stunning farewell to an airshow icon. Following a final howl XH558 pulled up into a seemingly endless climb before it performed one final wingover as if to wave goodbye, and there were even a few car alarms ringing out, magic! A dot on the horizon, but an iconic departure that will live long in my memories. While I treated that wingover as my Vulcan goodbye, I was lucky enough to catch that delta wing one last time, at Dover of all places. The farewell tours carried out on the weekend of the 10/11th October were a huge undertaking and the team should be applauded for pulling off such an event. I chose Dover as it seemed to be a safe bet as a waypoint which would not be altered. I also felt the seafront location might have provided a little more than a single pass, not to mention the stunning views from on top of the cliffs. As it turns out it was a single pass was all that we got, but what a final farewell. Taking us by surprise, appearing over the rolling hills north of Dover that classic shape and smoke appeared on the horizon, passed over the white cliffs and gave a wonderful topside pass low over the sea and port at Dover. 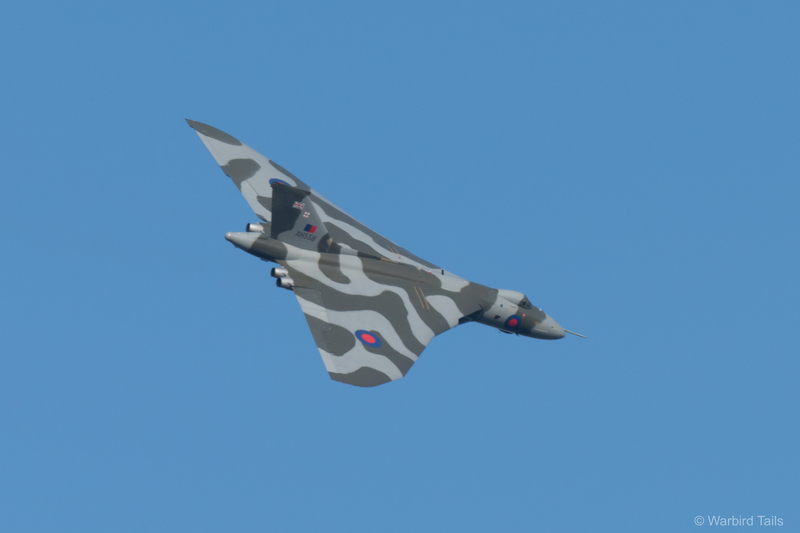 I decided not to take my camera for this final date with XH558 as I wanted to savour the moment. However here is a phone snap of the stunning scene. Its been a long and memorable journey for XH558 and the Vulcan To The Sky team, 8 years on and they can take comfort in a job well done. They completed far more than they ever expected to and it was all carried out safely and professionally. “Finals to Land” – A final display at Shuttleworth on 4th October. When the dust has settled I think we will all miss that familiar shape, despite some of the dramas and politics that came along the way. I’ll take this moment to thank all that made it happen and all the crews who have made for such memorable displays over the years. Farewell to flight, goodbye XH558. 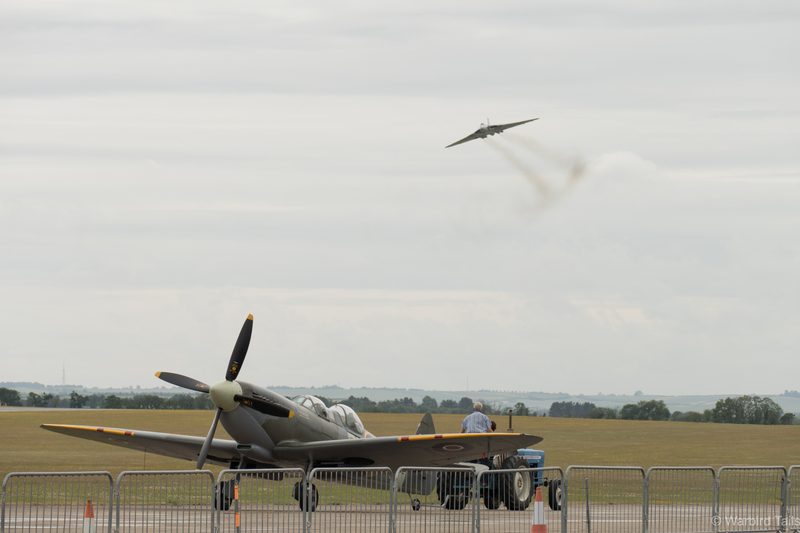 Another chapter of the UK Airshow scene closes, now it is time to look forward to the next. A fitting tribute – I still can’t get over the fact she’ll fly no more. Be interesting to find out what Dr Robert Pleming’s next project is.